Dr. Dozier grew up in Atlanta and earned a degree in Zoology from the University of Texas. She graduated from Morehouse School of Medicine, and received a number of awards including the Lange Award for Outstanding Academic Achievement, and membership in Alpha Omega Alpha Medical Honors Society. Dr. Dozier completed her residency at Emory University’s Department of Gynecology and Obstetrics, where she was selected as Chief Administrative Resident, awarded First Place in Residential Research Day and named Emory University School of Medicine’s Best Ob/Gyn Teaching Resident. Dr. Dozier joined Peachtree Women’s Specialists in 1997 and specializes in high risk pregnancies, infertility treatment and minimally invasive gynecologic procedures. She currently sits on Piedmont Hospital’s Value Enhancement Committee and serves as the hospital’s Section Chief for the Department of Obstetrics. From 2004-2006 she served as the Chief of Gynecology at Piedmont Hospital, and was President of the Atlanta Obstetrical and Gynecological Society from 2006-2007. 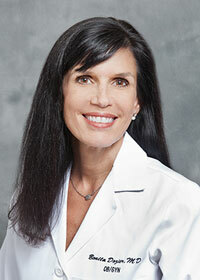 Dr. Dozier is a favorite of other physicians, and her patients benefit from her compassion and advanced surgical skills. Outside of work, she enjoys running and travel, along with her busy family life. Dr. Dozier and her husband, Arnie Mellits, M.D., have four children, one of whom was adopted from Ethiopia.